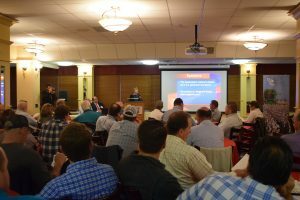 The California cotton industry gathered at Fresno State to participate in the 2017 Sticky Cotton Summit hosted by California Cotton Ginners and Growers Association (CCGGA). Dean of the Jordan College of Agricultural Sciences and Technology Dr. Sandra Witte welcomed the group to Fresno State campus and thanked the attendees for the ongoing support that the agriculture industry has shown for the Jordan College. Attendees of the summit had the opportunity to meet Dr. Margaret Ellis of Fresno State. Dr. Ellis is the recipient of a CCGGA research grant surrounding Fusarium in cotton and fungicide efficacy, she is the first professor at Fresno State to receive a grant from the Association. Jordan College Dean Dr. Sandra Witte welcoming Sticky Cotton Summit attendees. 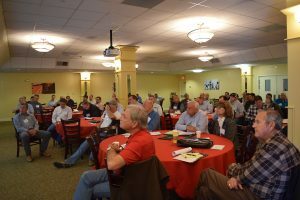 As the program for the Sticky Cotton Summit got underway panels from the mill, merchant, ginner, grower, PCA and UCCE offered their perspective on how sticky cotton impacts their respective segments of the industry. In addition, USDA-ARS researcher Chris Delhom demonstrated the diverse testing methodologies that are present throughout the country, in part creating an issue of developing uniform testing standards for the industry to adopt. The conclusion of the summit resulted in an open group discussion that led to action items for the industry and CCGGA to pursue. The items included looking into a uniform gin level penalty for sticky cotton delivered, conducting outreach, education and retraining on thresholds and best management practices for growers, seeking additional research dollars to invest in sticky cotton testing measures as well as increasing awareness in order to have more open communication surrounding the issue. CCGGA was directed to develop an industry subcommittee to ensure the progress of the action items outlined from the day’s discussion. We will be sure to provide updates and progress as these items are pursued. Following the summit Fresno State’s Ag One Foundation welcomed members and staff of CCGGA to tour Fresno State’s 1,000-acre farm, the Fresno State Gibson Farm Market as well as a tour of the new Jordan Agricultural Research Center. The tour showcased the diversity of the agricultural operations students have access to use as well as the vision for the agricultural centered research to be conducted on campus for years to come. This entry was posted in NEWS & ISSUES on March 27, 2017 by ccgga.